The police are needed in our modern society. I have no problem with that. However. The state politicians prey upon the public and use the police as their instrument to inflict financial misery. This I have cause to complain about. In an unfair draconian system where a speeding fine results in a criminal prosecution. Unless you plead guilty and pay the fine withing the 21 day period that they provide for. Otherwise you will either have to go to court and pay the court costs, or pay the freshly imposed court costs (for not just paying the fine), late fee (for not just paying the fine), and the original fine. No civil status is granted for statistical breaches of Government imposed law. Instead they impose a Criminal status so that they can take everything you have got to pay their unreasonably high, unjust fines. People that I know, on low income, dont like to see the Cops. If a cop comes knocking at their door. It’s because they couldn’t afford to pay a fine. So they may get taken away. They may have to serve time in prison. Or the Cop may have a new fine for them. It all adds up to misery. The politicians that originally cause it dont care. The cops who willingly inflict it on low income people dont care. I think the statistics should show, that low income people are more prone to repeatedly end up in some prison, from failing to pay fines, than any other reason. Years ago the Police acted human and would give warnings for minor breaches. These days they will fine you and hang the consequences to you. Leaves no room for civil disobediance.. But doesnt create a reason for me to help a Politician or Police Officer in need either. Four men were arrested last night at a Sydney rally in aid of Wikileaks and its founder Julian Assange. Crowds have rallied around the nation to support Wikileaks and its imprisoned founder, Julian Assange. The NSW Police yesterday issued a letter (PDF) to the organisers of the rally voicing its opposition to the action after the Support Wikileaks Coalition aired plans to march on the US Consulate at Martin Place. According to the NSW Police Service, the group was given permission to march along the footpath towards the consulate at 7:30pm (AEDST) last night. When the protest march arrived at the intersection of King Street, police allege that three protesters blocked the flow of traffic, which resulted in their arrest. A fourth man then allegedly punched an officer and was subsequently charged with assault. He is set to appear in Downing Centre Local Court on 11 January 2011. Rally chairperson and key speaker Antony Loewenstein told ZDNet Australia today that around 800 people attended the static protest at Sydney’s Town Hall, with roughly 400 embarking on the march. Pirate Party member Rodney Serkowski said that the presence of mounted police, dog units and riot police was antagonistic. “We worked with the police to make sure everything was fine, but the use of mounted police and bringing dogs was a little bit unnecessary,” Serkowski said. “It seemed a bit antagonistic,” he added. Loewenstein agreed, saying that police were inflexible about the rally from the outset. “The police were very inflexible about allowing [the march] to happen. There was a sense that they were trying to avoid any embarrassment while Oprah is in town,” Loewenstein said. Greens’ MP David Shoebridge addressed the rally and also joined protesters in their march on the US Consulate. He told ZDNet Australia that a wall of officers blocked the march along the footpath before organisers liaised with police to facilitate a way through. “To walk on the public footpath is the right of any citizen of NSW,” Shoebridge said. According to Shoebridge, police had a heavy hand with protesters, who were simply exercising their rights. “At a number of points, police reformed the cordon and bottlenecked protesters. Pushing and shoving occurred between protesters and the cordon,” he recounted. Shoebridge said that police and riot squads dragged at least two protesters from the intersection by their limbs, with mounted officers forcing people back to the footpath, which he was able to capture on video using a mobile phone. “I saw two people physically dragged away and arrested. After that fracas the police did what they should have in the first place and stopped traffic so that the protesters could cross the street,” he said. Shoebridge added that if the police had worked with the protesters and stopped traffic to cross an intersection, there would have been no public disturbances. “I saw some very physical force used by police,” Shoebridge said. Loewenstein and Serkowski both maintain that the scuffles have not tarnished the message of support. “I don’t know who the fault lies with here but generally you always get a few people who do, you know, make a bit of trouble. But the issue of Wikileaks transcends left and right divides,” said Serkowski. Organisers are planning an even bigger group action on 15 January 2011. And public events before that time will depend on the results of Assange’s legal battle in London. Spreading the message Political activist group GetUp! today took out a full page advertisement in The Australian urging Prime Minister Gillard to stand up for the rights of Julian Assange and to support Wikileaks’ actions. GetUp’s advertisement in today’s Australian. GetUp! is set to publish a similar open letter in The Washington Times and The New York Times to US President Barack Obama and US Attorney General Eric Holder to do the same. GetUp! told ZDNet Australia in a statement that it chose The Washington Times after it called for “the death of Julian Assange” and selected The New York Times due to the prestige of the masthead itself. The US advertisements are slated for print in tomorrow’s editions. So far, 91,429 people have signed the GetUp! petition, with 9187 people donating a grand total of $363,564 to take out the print ads. “It works out at an average donation of $39.50 per person,” GetUp! said. GetUp! was unsure of the cost of the advertisements, saying that the deals were worked out between the publication using ad buyers. MORE than 220 would-be arsonists were caught during a South Australian crackdown on deliberately lit blazes over the past summer. Police patrols of high risk areas during scorching summer days resulted in 42 people being charged and another 187 receiving fines for fire-related crimes, the state government said. Of those charged, four are before the courts on arson offences while 16 are accused of starting or trying to start a bushfire. “We have always maintained that arsonists are like terrorists within our neighbourhood,” the state’s Emergency Services Minister Michael Wright said today. 42 Accused of Arson. 187 Backyard BBQ/Burnoffs fined during crackdown. But that wouldn’t have read as good as “Hundreds of would be arsonists nabbed”. lol..
Thats fine for the dumb arsonists. But what about the Mums and Dads who had no intention of starting bushfires deliberately. There will be 187 people who will be caught up in legislation designed to have a “Zero tolerance”. Are they being dealt with fairly? Given that the SA Government have adopted this “Zero tolerance” attitude? If members of Parliament are unable to get documents from SAPOL. What hope do I have? Sounds like what I have been saying doesnt it? I am afraid I’m quite shocked at this news. I shouldn’t have been I guess. I should have realised by now that the Australia from my childhood is long gone. I will twitter this email to my website. You never know there may be more people than just myself interested in the outcome. You make me wade in Red Tape? This seems to be the same story as last time. I am as yet no closer to obtaining the information I require. Lets see if I can speed it up a bit..
Do I need to get a “PD360” - “Application for Access to SAPOL Records” form? Because I have obtained one of those already. What is the official term that SAPOL use for the guidelines when handcuffing? Ok.. So answer this then..
Has the Minister been briefed on this issue yet? Does the Minister have any other means of communication available with the Police other than via “PD360”? Does the Minister believe there should be ‘transparency’ to the public, for members of the Police, as well as elected and public officials? Is the Minister aware of other members of the public approaching the Minister for similar requests about “not publically available” police documentation? Would the Minister consider a “Police Tranparency” bill to make this kind of information more easily available to the public? Does your office receive similar requests about accessing other SAPOL information? Do you offer the “PD360” form to the public? Is the Minister aware of the contents of the SAPOL Hancuff documentation? Will the Minister make himself aware of the contents of this SAPOL Handcuff documentation? Would we all be so “outraged” if we knew what the police can do to the public? If that is the case. Then obviously this “proceedure” needs to be modified. We are (after all) all members of the public. As members of the public, all of us could face this “information blank wall” sometime in the future. In my opinion, the Police have way too much power as it is. Without resorting to “the information is not publically available” answer. Police will lie against the public to protect each other. According to the police statement I fell on my bottom. How do the police explain the photos of the damage on my body then? My photos prove they lied. I now know from personal experience, the police have way too much power. Shouldn’t we try to make some changes to the system for the good of all, before our limited time is due? Some decent changes now may help your great great great grand kids someday. Maybe they wont end up aimlessly roaming the street corners or much worse, hating the police, because they DONT like what they see in the society that they live in. Isn’t part of the solution to fix the rot when we see it? Well.. I see it.. Many have seen this police rot. The problem is. I dont believe that I would be the first person to approach you in this regard. I would like the Minister to get behind the public and push for greater tranparency of police guidelines. But your not the most popular Minister in Australia, so I can assume your heart has not felt the need to get behind such a venture previously. You need a reason to know correct police proceedure? With or without a valid reason the public should be able to access this information. If for nothing else than for the sake of reasonable “transparency”!! I believe the question of corruption in high places has again reared it’s head in Queensland. Based on my own perspective, I suggest to you that a similar situation must exist in South Australia. Parliament, The Courts, and the Police should be investigated throughly. All corruption should be disposed of. If it’s too hard to fix corruption. Then I suggest to you that the reason is because there are too many corrupt people becoming involved in the so called “fixing”. Ok.. Here is my reason..
1) I consider that I was assulted by Police. The Police in question then handcuffed me. I spent 2.5 hours in those handcuffs. While in the handcuffs I was assaulted by the police using the handcuffs as a means to purposely inflict pain upon me. At the police station door I cried out to passerbys that I was being assaulted. But the police claim a different story. They say that I was arrested at that point in the doorway. They claim I struggled to avoid arrest in the doorway of the police station. In actual fact. After being jostled and finally pushed to the ground in front of the ANZ bank. I became angry and started swearing while threatening the police with an assault charge. It is at that point that I am again pushed to the ground. Face first. (See : Images) The handcuffs applied. I was already in handcuffs and had walked (while abusing the police for assault) across the road and down to the police station in handcuffs with them. So the police fabricate the charge of resist police. I never resisted them except to say they would be reported for assault. I did stall in the doorway of the police station because I considered that the Policeman that was inflicting pain on me via his way of grasping the handcuffs was in breach of police guidelines. But according to the police statement. I tried to grab the handrail to stop them from pushing me into the police station. I can assure you that would have been impossible. I had both hands handcuffed. I did cry out to passing pedestrians that I was being assaulted by police. I believe this is how they justified it to the public. By claiming the were arresting me in the doorway. They put me in the Cells for about 80 minutes. The desk seargent ignored my pleas of assault in preference to his ‘buddies’ arrest record. So no help there. Then I was transported from one Police station to another police station. In the back of a ute with a cage. At the second police station the handcuffs were removed. No reason was given for this “transportation”. The Police knew that I had 2 teenage children at home while they delayed me futher transporting me around the state. I believe that the Police acted to purposely inflict as much pain as they legally could on me. Because I had already told them that I was going to report them for assaulting me when I initially encountered them and was assaulted by them. Who wouldn’t be angry at such treatment? But the police are a law unto themselves. They told me in the second police station that the handcuffs would stay on and they wouldn’t transport me back unless I “calmed down and co-operated”. So I sullenly gave up trying to get someone to notice the corruption in the police stations. When I was in the first police station I begged them over the intercom in the cells to at least loosen the handcuffs. I begged them in the ute when I was being transported to the second police station. I screamed 3 times for them to loosen the handcuffs while I was in the ute (Trip took maybe 30mins). The Police laughed to each other. (I could see through the canopy window into the cab of the ute) I didn’t see the joke! The Police didn’t act reasonably at all. Maybe they are used to pushing people around like garbage. But I am not used to such treatment. I have never had a “run in” with these police before. I have no “old axe” to grind. So neither did the police. This makes it even worse in my opinion. Obviously all members of the public are treated this way by these police. They must do it so often that they believe they are quite untouchable. Because I am a single parent who’s sole income is from the federal government. I determined to get out of this whole mess as cheap as possible. I have been to court. I had no legal representative. I need to pay a $400 fine. I pleaded guilty to the charges to get them gone. Now hopefully I can concentrate on making some bad cops gone too. Part of that is finding out what parameters the Police operate under. So I request the South Australian Police Handcuff proceedures or guidelines or recomendations, or whatever the police call it. It's against the law to NOT know the handcuff proceedure? 2) The public is told by the courts that ignorance is no excuse to the law. So really, just based on that, I should be able to request this information. Of course the public need to know what the police guidelines allow them to do to us while in handcuffs. Armed with that information. The public will finally know when or if the police have exceeded their guidelines. Obviously that is something that the Police and the elected officials they hide behind do not want to change. Why the &^%$ not tell us? What they hiding from us? Perhaps the Police are operating without proper legislation to backup their actions? Why else are they so secretive about their “guidelines”? I can only guess at the reasons why the Police choose to act this way in this matter. Am I the first idiot to make so much noise? Am I the first person that you have ever encountered, who consideres that they were mistreated by Police, to have ever approached this office? Am I the first person to try and access the “Handcuff protocol” from your office? I am quite disappointed in the reaction from the Police Complaints Authority and Your Office at multiple ignored requests to gain access to this information prior to going to court. The “PD360” form was only obtained in relation to my dealings with the CJS. I was never offered this form by your office or the Police complaints authority. Even though I obviously required the information prior to making a decision on how to defend myself from the charges I was facing in court. In this matter I believe that the whole system conspires to pervert justice. Is the “PD360” form on the “not publically available” list? On the scale of things this is positively a “storm in a teacup”. I understand that. There are much larger and more pressing matters before the Minister. Of that I am sure. In some ways I am sorry for wasting so much of your time on such a trivial matter. But then I remember how annoying it was to be treated like garbage from nearly everyone I tried to speak to about this. I have to re-initiate more written complaints to the Police Complaints Authority before they will investigate futher. I will be going ahead with that within the next few days. Self Promotion, Public Scrutiny Dept. I refer to our telephone conversation earlier today about handcuffing procedures. As this is an operational matter, I have made enquiries on your behalf with the South Australian Police, and have been advised that the information is not publically available and that I will need to officially seek the information from the Office of the Commissioner of Police via written request. Do you have any more details about what specifically happened to you or why you want this information that may help with this request? Alternatively, you may like to have your lawyer seek this information directly from the Police on you behalf through disclosure. Well.. I got the letter from the CJS. It contains the official Police 3 page version of events. This is the statement that they are going to Court with in 4 days time. The Police version of events differs considerably from my recolection. I can find little fault with. The overall timeline is accurate. However they attempt to sensationalise or overstate my admitted anger at being stonewalled by the self regulated bank. My comments were directed towards the Banking system that allows the Bank to know the exact balance of your account, but at the same time, witholds that information from the rightful owner of that account. Another witness (N.B) was also a customer in the bank at that time. I.D’s telephone call was unsuccessful and aparently I left at 3.45pm. I returned around 4.00pm. 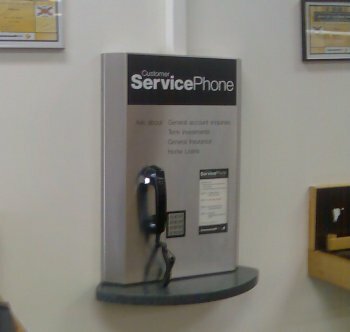 It had occurred to me to use the “Customer Service Telephone” inside the Commonwealth Bank to try and find out for myself what had happened to my funds. Yes plz.. Ok they make me sound pretty bad hey? Well my only defence is that they overstate my anger, ferocity, and level of voice. I admit that I raised my voice. However, they did not mention swearing did they? So perhaps my anger was somewhat overstated? Because I can assure you dear reader that when I an angry and furious. I do yell. I also swear. I reckon I could possible peel paint with the combination of anger and language coupled with volume of voice. I knew I was being abrasive towards the staff. Unfortunately, those staff members provide the only contact Bank customers get with the Commonwealth Bank. A squeaky wheel gets the oil. I make little appology to the staff for my comments. The only concession I give is to M.M who obviously isn’t suited any kind of conflict. To her I do appologise. I hope she never again encounters a customer who is angry and yelling about Bank policy. To my way of thinking, If I were to quietly walk away, when being told that the self regulated Bank, cannot provide me with my details when requested. The Bank would never change their policy. I would also be doing a dis-service to the millions of other Bank customers who would also like up to date records being made available. Banks reduce red tape, lower fee’s, and charges etc. Why? Because of the combined preasure dissatisfied customers can bring to that Bank. But now we hit Page 2 of the Police statement. The timeline of events no longer is totally accurate. Also, the Police use of descriptive terms to describe me, now moves into overdrive. I do not believe that I screamed at anyone or at anytime while in the Bank. I know that to do so in public, would invite interventions from at least the Police, and perhaps even the Mental Health authority. I desire interventions from neither of them. Therefore I would not ‘scream’ in public. I ‘raised my voice’ yes. Borderline yell perhaps? Yes perhaps… I do admit I was angry. But ‘scream’? Nahh. I had given M.M my Bank Instant Teller Card. She was accessing my Bank account with it. I spoke to a nice fellow who got straight onto the problem for me. I was telling him that the staff at the Commonwealth Bank in Millicent less than satisfactory. He put me on hold while he searched for the information I requested. While this was going on witness HR (staff member) called the Police. The Police responded while I was still on the phone. I saw them enter the Bank. A staff member came onto the floor of the bank and began speaking with the two police officers. HR states that she was asked by Police to request me to leave the bank, but she was too scared to go and speak with me. The staff closed the door of the bank. The police state that two of the three staff (I.D, M.M) felt scared and intimidated by my behaviour. N.B recalls I began to abuse the Police of Assult. That concludes the Witness evidence that the Police claim is accurate. 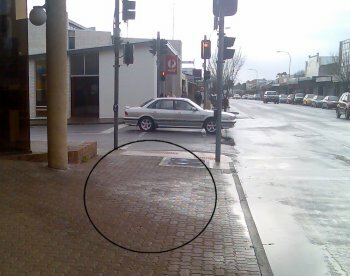 Above: Where I was initially handcuffed after being assaulted. Police say they approached all three bank staff. Observed H.R to be shaking. LEYDEN responded by “pushing me with two open hands” shouting “go away”. Police claim I then stumbled and fell onto my bottom on the pavement. Police claim LEYDON grabbed hold of my arm to arrest me. 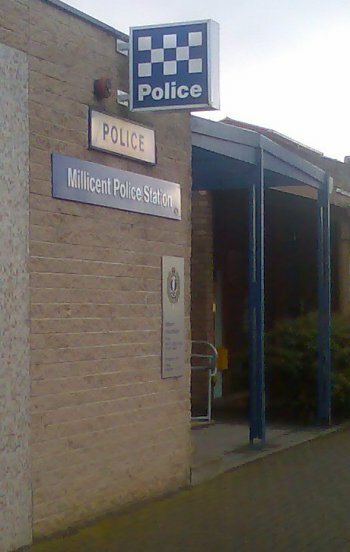 Above: Entrance to Millicent Police Station. I find that hard to believe. But the police continue to jostle me away from the Commonwealth Bank. I am abusive of the treatment I am receiving from the police. One of the policemen gives me a particularly hard push and I end up on my back lying on the ground. It’s at that point that I started yelling and swearing at the police. Calling them F* Pigs and standing up. Thats when I am pushed to the ground again. (Face first this time) and handcuffs are placed on my wrists so that I am in extreme agony. The police officers get me up and while controlling me via the handcuffs (digging in) proceed to direct me towards the police station. I ask them if I am under arrest. They tell me that I am. I said “You are assulting me. Aren’t you? you little copper prick” as I was being forcably pushed into the Police Station door. 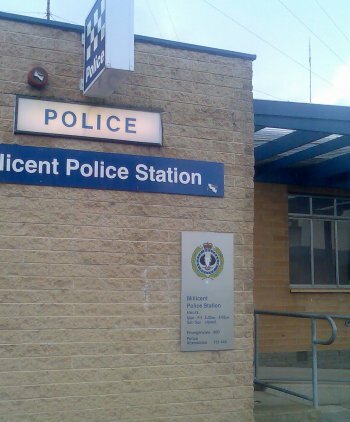 Police claim “Taken on foot to the cells at Millicent Police Station and presented to Sergeant PHILPS at the custody suit. Police claim at 4.20pm LEYDON read me my arrest rights during which they claim I continued to shout and scream. Police claim that I was not interviewed in relation to this matter due to my constant abusive and uncooperative manner. I have no idea of the charge at this point. Nor do they inform me of my rights. They push me into the Police Station at Millicent. They take my possesions and shoes from me. I have a very brief interview with the desk sargent. I inform his that his officers are breaking the law. That If I was so abusive in the Commonwealth Bank how come the Customer Support Unit on their internal phone were ok to talk to me? He has no sympathy for me. I also inform the desk sargent that I must return home as my children will be alone and worried at my delay. No one hears my plea. I am then placed into one of the Millicent cells. Still with the extremely tight handcuffs on. I get really angry. In my opinion the police have created this problem for me. They leave me in the cells for some time. During that period. I initially am very angry. Kicking the metal cell door with my socks while singing a ditty that casts aspersions on the relative merits of being a member of the police force. I sing about two choruses and realize that I am having an anxiety attack. So I try to calm. It occurs to me that Im in a bad situation here. No one knows where I am. The police officers have acted totally unreasonably. It just makes my anxiety attack worse. Thankfully the handcuffs are still causing me so much pain that the anxiety attack takes second place as I get angry again that the police are subjecting me to what amounts to torture. So I try to press the intercom button to get someone to release the handcuffs. An extremely painful proceedure with your arms handcuffed behind your back. I have two or three attempts to get someone to respond over the intercom. I plead to an unresponsive machine for the handcuffs to be loosened. But I am unsuccessful. After some time. The desk sargent with the two offending police officers opens the cell door and asks me if I am ready to calm down yet. Again I attempt to receive some justice at the hands of these police. Denying that I had been “out of control” in the bank and therefore this was an unjustified arrest. They closed the cell door and left me there. Still with the despised handcuffs on. After I had been in the cell for aproximately 80 minutes. The sargent and his two cronies appear. I am taken to a police utility that has no restraints, heating or accident padding and pushed into the back. Still in handcuffs. I am told they are transporting me to Mt Gambier. To be honest. I am starting to fear for my ultimate safety in the hands of these two police officers. I am wondering if I will make it to Mt Gambier. In the back of the Ute getting bumped around the handcuffs started to really dig in. I screamed to the two policeman to release the handcuffs. I told them to leave them on. Just loosen them. The two police officers completely ignored my pleas. This happened twice during the trip to Mt Gambier. Finally I arrive at Mt Gambier police station. I beg the desk sargent at Mt Gambier to loosen the handcuffs. She refuses and tells me I have to calm down before the handcuffs will be released. I was told that If I didnt fully calm down and totally comply with their requents they wouldn’t give me a lift back to Millicent. So I stand there in pain waiting. After awhile the police decide that they will fingerprint me and do a DNA test on me. In my opinion my fingerprints and DNA samples were obtained illegally. However to obtain fingerprints the despicable handcuffs are finally removed. After that they decide to “process me” I am told that I have been arrested for disorderly behavious and resist police. I am told I am to be placed on bail. I am told I will have to appear in Court. Three Officers now decide to hold me violently against the desk sargents desk. The police officer that initially threw me down and arrested me is being particularly cruel. Pushing very hard against my right kidney. The back of my shoulders are bruised and sore from the initial push to the ground. My left shoulder at the front is swolen and scraped, my chin is cut graised and bleeding, my left hip has bruises, My arms have bruises, my kidneys are sore. I turn to face him at three times while they held me against the desk. (Im getting even angryier after looking at my wrists) He told me to turn back to face the desk sargent. He proceeded to shove against my kidney because I didnt want to comply with his request that I only look at the desk sargent. I told him I wanted to remember his face. He took that to mean that I was threatening him. I corrected his mistake by informing him that I was a promice not a threat that he would be reported for his actions. Finally after reading out the bail conditions the desk sargent at Mt Gambier wants me to sign the forms. But I do not have my glasses on anymore? Seems I have misplaced them. (Later found in my car) So I am unable to read what I am signing. Whatever I signed. I did not get a copy of it. I had to give them my signature on three documents. I am given my possessions back. So I am able to wear shoes again. They place me back into the Ute with no seatbelts, heating or accident padding and transport me back to Millicent. On arrival in Millicent. They let me out of the back of the Ute. Blah Blahed me about the bail conditions. Making sure that I understood the bail conditions. They finished being “good cops” I walked off in complete disgust. They drove off immediately. Well… It was close to the truth.. Of course the Police left out most of the stuff that they did wrong. Like how they assulted me and put handcuffs on me in front of the anz bank. That resulted in the damage (above Image) that they did to me. Their version of events wouldn’t have left marks like this on me. Therefore the police LIED in their statement. All previous arrests from these ‘Officers’ in my opinion should be considered in a new light. The trip to Mt Gambier with me in Socks and Handcuffs all the way was particularly cruel. How they obtained fingerprints and dna samples in Mt Gambier. 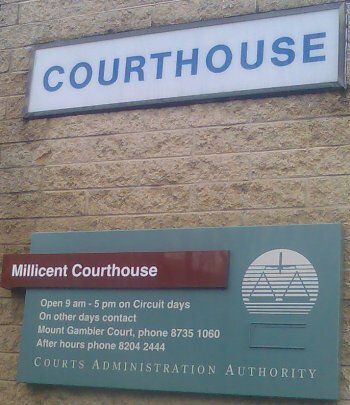 How my bail conditions were agreed to and set in Mt Gambier. There is evidence to ‘prove’ my statments. Unfortunately (for them) these ‘cops’ have left a paper trail. 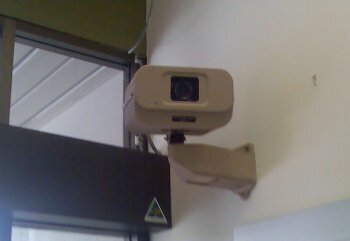 There is video evidence at the Bank. 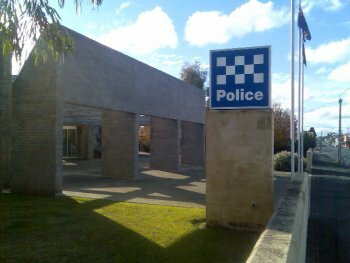 There would have been video evidence of my arrival, handcuff removal, fingerprinting and dna capture, being held against the desk by three police at the Mt Gambier police station. I will be applying for that footage through feedom of information. The Mt Gambier desk sargeant also signed my bail form. The paper trail is easily proven. So the ‘bad cops’ are gonna get busted for how they teated me. I will defend myself and plead guilty on 22nd to both criminal charges. But I will contact a Solicitor about a civil case against these two ‘bad cops’, It should be obvious to almost everyone that these guys ‘need to go’. The duty sargeant at Millicent is a total arrogant ‘head in the sand’ police officer. He did nothing to help the situation for me. Even though he knew that I had been making accusations of police corruption. If he really did have the public interest at heart he should have at least interviewed me about my accusations. But he reacted, unfortunately, by following suit and ignoring my pleas. In fact everyone I have spoken too since this sorry fiasco started has been less than helpful. With the exclusion of the Legal Services Commission. They have been at least been fair. I have applied to the Commonwealth bank for a copy of the video evidence from the bank. That should backup my claim of being less angry than the staff have indicated. That should also show that the police rather than ask me to leave and finding out what my issue was. Just forced me physically out through strongarm tactics. I think the police should drop the criminal case. Otherwise they will be doubly embarased when I tell my story again in civil court. The Commonwealth Bank isn’t looking too good in this either. Surely a customer should be advised if the staff would like them to leave? To just call the police without warning? When they knew darn well that I was massivly unhappy with the bank in the first place??? I can obtain the Police report before the Court case. So I contacted CJS Mt Gambier today. Normally your soliciter will do this for you. But it is looking like I will be defending myself in this case. They required a written request for the information to be released. In my case they accepted an email. So I am waiting to see exactly what this “Police report” will contain. I may have to get involved with the Commonwealth Bank before this is over. Depending on what their staff said if/when they contacted the police. How to "Follow the Law"
Well… This day was taken up with the frustrations of trying to obtain information from the Police. I don’t have much contact with the Police. I tend to keep myself out of trouble as much as I can. At 52 years of age, revenue raised through traffic violations has been my main contact with Police. However due to the events. See: 2009-06-25 Police. I now find that I need to access Police information. What are the rules of handcuffing? I am trying to locate the guidelines or protocol or rules that the Police in South Australia must follow when inflicting handcuffs on a member of the public. So far I have been totally unsuccessful in obtaining this information. Here is a list of ‘who I contacted’ and ‘what they said’. Result: Receptionist (with a bored ‘I dont care/You got nothing’ attitude) said to contact a police station for this information. I became angry with this nonsense ‘round in circles’ attitude directed toward the public. So I told the receptionist that I would contact the Police Minister. She invited me to do so. I asked what the number is? She said she didnt have it. Of course this made me even more angry that the Police Complaints Authority wouldn’t provide the phone number of the person who is ultimately responsible for the Police organisation that they themselves claim to Police. So I hung up. Left some time to cool down. Called Parliament House in Adelaide on (08) 8237 9100 and found out that the Police Minister is Michael Wright. Contacted Michael Wright’s Office. Asked for the Handcuff protocol information. Asked why am I given the run around by Police and Police Complaints Authority over this issue? Result: Receptionist said someone would call me back. Took number. Spelled my Name back to me. Initially very angry after this conversation. I calmed down and began to realise how futile the situation really is. I became rapidly depressed and so with a sinking feeling in my stomach, I again contacted the Police Minister. Informed receptionist what Police Complaints Authority attitude toward the public is. Again asked if I could speak to someone about this situation. Told receptionist that my perception of the situation was that I must be missing the secret handshake. Because, In my opinion, I dont seem to be a member of the club. Receptionist seemed sympathetic to my glum resolve and promiced to get someone to contact me. I was told that she would make it her priority to get someone to call me back. Result: Still no information about the Police Handcuff Protocol. Informed free soliciter about problems I am having obtaining information from Police. Strangely enough this is the one person that I have spoken to all day. Who doesn’t treat me like I am speaking a foreign language. Seems everyone! (even soliciters) have trouble obtaining simple information about Police proceedure. Result: Anger at a system of corruption that allows this to happen. You know we are all responsible for letting the RICH make the LAWS that govern us. I think the POLITICIANS who control the POLICE are unjust and unfair. They must begin to fix the issues and so eventually we will have a decent governing system. All I can currently see is a system that ignores the obvious corruptions. The Police Complaints Authority does not assist the public with complaints against police. They take the complaint and make a decision (very quickly in the negative) without futher corespondance. (They got 2009-06-25 Police emailed to them) So the case is now closed according to them! (I have a written reply dated 2nd July) They await the outcome of the court proceedings against me. That of course sets me to write this. Because thats my only recourse. I know I will have to plead guilty to both charges on the 22nd. Because I simply dont have the ability to defend myself without financial assets. Would I change anything by dragging the result through endless court cases? No. So all I can do really is EXPOSE them via twitter. There is corruption in Politics too? (stop smiling.. its actually quite sad).. Otherwise Wichael Wright’s Office would have taken my complaints more seriously? Voting Link: How Corrupt do you think the Police are? Try asking your Police for a Handcuff protocol or procedure or guidelines and you too will see the corruption in your state/district/country. Since 2005 I have been an unemployed single parent in receipt of Federal Government benefits. I am the sole carer for my two teenage children. Because of this, I have had to deal with a changing Social Security system that has placed enourmous financial stress on myself and my family. The Centrelink system and my ‘preocupation’ with keeping the wolf from the door has demanded that I contact Centrelink 2-3 days prior to my benefit being deposited. In that way, If my benefit has been compromised, I may be able to get it re-instated without missing my normal payday. I normally only come to Millicent once a week and always on a Wednesday. It is at that time that I pickup my mail. It is then that I sometimes discover that I have been cut off Centrelink payments. This proceedure of being cut off and having to wait for payment, is highly stressful to myself. I have pointed out to Centrelink that rural customers should have their responses to Centrelink requests delayed in accordance to their remoteness. On the 23rd I contacted Centrelink to enquire into this weeks payment. I was informed that $450 (less my standard centrepay bill payments) would be in my bank tomorrow. The 24th. 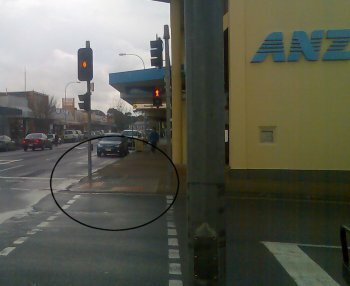 On the 24th July 2009 just before 4pm I attended the Commonwealth Bank, George Street Millicent. I accessed the instant teller machine and to my dismay there was only $408 available. I demanded to know what had happened to my account. The staff explained that they couldn’t access the transaction record of my account for some days. But this infuriated me to the point that I stormed off to the Commonwealth Bank Customer Service Telephone that is available to customers on the wall of the bank. I am an idealist. I believe that for every problem is a solution. As a result, although I know how to control my emotions. I dislike dealing with companies that only provide inferior Customer Service. I find it difficult not to point out how certain monopolistic organisations, Like Banks and Communications Companies continue to fail their customers. I specialise in using controlled anger to drive my point home to uncooperative staff members. On the day in question, I do not consider that I acted any differently than I normally would under similar stressful conflicting conditions. Being an idealist normally doesnt win me any friends. However I always feel compelled to point out obvious flaws in the various systems As I see them. While I was on the phone to the Commonwealth Customer Service Unit. 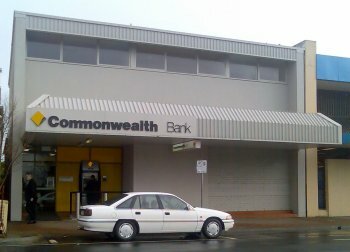 The police attended the Commonwealth Bank. The next thing I know. They grab me and drag me away from the phone. I am speaking to a Commonwealth Customer Service Representative at the time and tell him I am being assulted by the police. I have no idea why I am being treated this way. Initially I think they have made a terrible mistake. From there I am pushed and jostled out the door of the Commonwealth Bank and pushed towards the ANZ bank. I am trying to ask the two police officers why I am being treated like this. They tell me that the staff at the Commonwealth Bank called them. It’s at that point that I started yelling and swearing at the police. Calling them Pigs and standing up. After that they decide to “process me” I am told that I have been arrested for disorderly behavious and resist arrest. When I tried to put petrol in my car to return home. I discovered that my Commonwealth Keycard was missing from my personal effects. So I had to find my way home without funds. The next day, after speaking with the Commonwealth Bank Head Office about the preceding days events. The Commonwealth Bank Millicent was contacted by them and my missing Keycard was located in their possession. The police had dragged me out so quickly that I was unable to retrieve my Keycard from the bank staff. The Staff at the Commonwealth Bank appologised to me the next day for the unexpected heavy handedness of the police the day before. Due to my bail conditions and not trusting my ability to respond without malice I refused to comment more than a few words. I am far from impressed with this token appology. Since this attack. My nerves are shot. My whole body shakes as I struggle to regain my normal composure. I am sore from the numerous injuries. I feel betrayed by the police and the whole system. I have no idea of the identity of the desk sargent in Millicent or Mt Gambier. Neither of wich thought it nessary to intervene in the treatment I was obviously being subjected to.